A computer user discovers a new piece of information through a "Mouseover" action. The associated action area is setup in such a way as to grab the attention of a user when a mouse hovers within it. A gardner, on the contrary, helps a sapling grow by voluntarily keeping his attention within a piece of land. 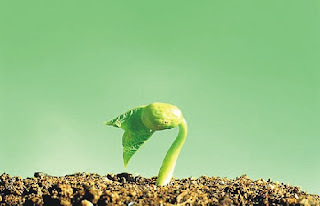 A sapling grows on its own. The gardner removes weeds from the vicinity and waters and fertilizes the ground below. Ancient experts studied the movement of human consciousness. A target is involved when consciousness is focussed. A Sanskrit word for Focus is Dhaanam (धानम्). Consciousness hovers in a general area instead of being focused in the case of Avadhaanam (अव + धानम्). Experts developed ways to tap into different skills of the human brain such as focus and hovered mode of attention. They trained students to catch questions posed simultaneously by number of people in the audience. Trainees could remember the sequence in which the questions (upto 100) were presented and could also provide appropriate answers. One skilled in this art is called an Avadhani. Kings periodically organized competition among Avadhaanis in the past. The consciousness of a gardner is a special case of Avadhaanam. A gardner's goal is the growth of a sapling. A gardner's focus and actions in the vicinity supports that goal. This mode of consciousness is बीजावधानम् (बीज + अव + धानम्). The word बीज refers to a seed or a sapling. Developing higher states of consciousness begins with this kind of attention. Sri Sri Ravishankar explains this in his commentaries on the Shiva Sutras.